It’s been several weeks since Hurricane Harvey battered the Texas Gulf Coast and many cows and steers have been located, but with no way to reach the animals, they remain stressed, in poor health, many are starving for lack of food. Some are stuck in mud, or sheltered on small patches of dry land surrounded by flood water, reports Southwest Farm Press. According to John Grimes, OSU Extension beef coordinator, weaning is a great time to determine the pregnancy status of the breeding herd. The most important factor to determine whether to keep or cull a female is pregnancy status, reports the Coshocton (Ohio) Tribune. The annual carrying costs for a beef female can run from $700 to more than $1,000. Every situation is different, but a producer is almost always better off selling an open female and replacing her with a bred female. This is particularly true of yearling females. While US beef has been approved for import into China for some time now, developing that market is still a work in progress. The first shipments of U.S. beef are just now reaching China's shores. However, at the end of this month, the U.S. Meat Export Federation will be showcasing US beef in some of China's largest cities, according to the Oklahoma Farm Report. “The potential is big on the value side. This market is not going to be the biggest volume market," Halstrom said, explaining that this market could grow exponentially over the next 10 years or so, particularly in variety meat purchases. "The variety meats, in my mind, the USTR did a wonderful job negotiating this agreement. This is the hidden benefit of the agreement." Beyond Meat has reached a deal to partner with Sysco, the nation’s largest food distributor, to add The Beyond Burger -- which will be the first plant-based burger that looks and cooks like traditional beef -- to Sysco’s Cutting Edge Solutions (CES) program. It will be sold in the meat section at grocery stores. The exclusive deal between Sysco and Beyond Meat will open distribution of the ground-breaking Beyond Burger to thousands of burger joints, restaurant chains, hospitality properties, health care centers and educational facilities nationwide, reports Feedstuffs. Cattle, pork, fish and bee organizations have petitioned the U.S. Department of Transportation for a one-year exemption from compliance with a rule that will require electronic logging devices for truckers to track their time behind the wheel. The rule is set to go into effect Dec. 18, reports the Capital Press. 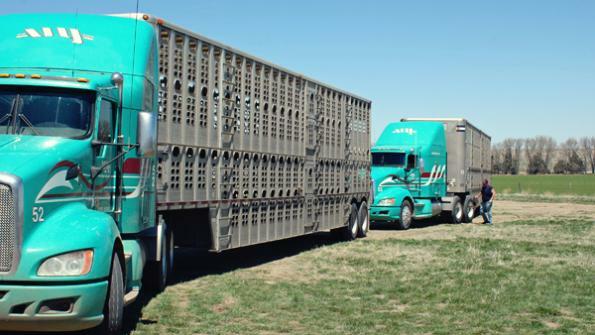 In conjunction with the ELD exemption, they are also asking for increased flexibility for livestock haulers in the hours of service rules that restrict how long truckers can stay behind the wheel.